Flippant? Oxford Dictionaries? Who said so? Oh, Oxford Dictionaries. A Canadian anthropologist, Michael Oman-Reagan, tweeted Oxford Dictionaries last week to ask it why “rabid feminist” is its … usage example for the word “rabid”. Oxford Dictionaries responded by suggesting Oman-Regan may be a rabid feminist. It has since apologised for the “flippant” response and is reviewing the example sentence. Wordwatch Towers has previously pointed out examples of sexism within the (virtual) pages of Oxford Dictionaries and we’re (me, the butler, and my reader, Gladys) are glad to see this being given a prominent airing over the Interwebs. A peacock. Not prone to distraction. Obviously. This morning, a story about peahens made me angry. (Did I just write that?) Or rather, the reporting of it did. It was the BBC, too. Shame on them. You know that thing – how descriptions and interpretations can differ, depending on whether the person being referred to is female or male? Anyways, I was half-listening to the BBC’s flagship news programme on the radio this morning when a ‘scientists have found’ story came on. Apparently, according to the BBC, ‘scientists have found’ that peahens are ‘prone to distraction and easily lose attention’. That noise is an alarm going off. The Wordwatch Towers butler just checked and has confirmed it’s the ‘women being undermined via descriptions of the animal kingdom to avoid accusations of blatant sexism’ alarm. Thought so. I checked. 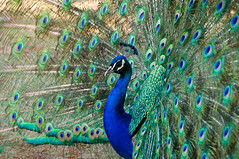 In fact, the scientific study has found – no surprise – that the female of the species in Peacock World, the maligned peahen, is actually a multi-tasker: Dr Jessica Yorzinski explains (on the BBC’s news website, ironically) that peahens have to stay alert, shifting their focus between potential mates and their immediate surroundings to avoid being eaten by a predator. The exact opposite of being prone to distraction and easily losing attention, I would have thought. Still, why let the facts get in the way of a cheap (sexist) jibe? I’m willing to bet an extensive amount of chocolate, two wildlife DVDs that I’ve never watched, and my ticket to see Harold Pinter’s The Hothouse (this Saturday: very excited), that similar findings about peacocks would not have been deliberately misinterpreted in this way. You might also like: The female of the species. The programme raises a number of interesting issues, but I’ll stick to the language-related ones. Firstly, and most straightforwardly, a common error: Derek is described in the Guardian as ‘a 50-year-old man with an undiagnosed mental health problem’. Now it’s safe to say that Derek is depicted as having some kind of learning difficulty or disability. This is not the same as having mental health problems. Journalists should ensure their terminology is correct. Gervais insisted that the character is not intended to represent a specific disability; he is simply naive and gullible….Personally, I accept that Gervais is not portraying someone living with an identifiable syndrome. But, for me, this is a weakness of the series…The drawback of Derek is not that it is cruel about disability but that it is often soft on a character whose identity remains too vague. We shouldn’t feel this need to place people in neatly labelled boxes; their individual identity is not defined by a diagnosis. And it should be noted that Derek’s identity as portrayed by Gervais is anything but vague. Tellingly, none of the other characters portrayed in the programme have been criticised by TV critics for not having been assigned a label. Even though none of them have one. As Derek says in response to an official’s offer to have him ‘tested for autism’, if being ‘tistic’ doesn’t mean that he’ll die and won’t change him, then he doesn’t need to find out, thanks. And neither do we. The words, the labels, would get in the way of the person.